The GMSE package can be installed from CRAN or GitHub. The easiest way to install is through CRAN using the install.packages function in R (Note, R version 3.3.3 or higher is required for GMSE). Use install_github to install using devtools. ##  "Initialising simulations ... "
##  "Generation  33 of  100"
##  "Generation  62 of  100"
##  "Generation  95 of  100"
Figure 2 above shows the simulation dynamics over time for the starting parameter values set in sim. 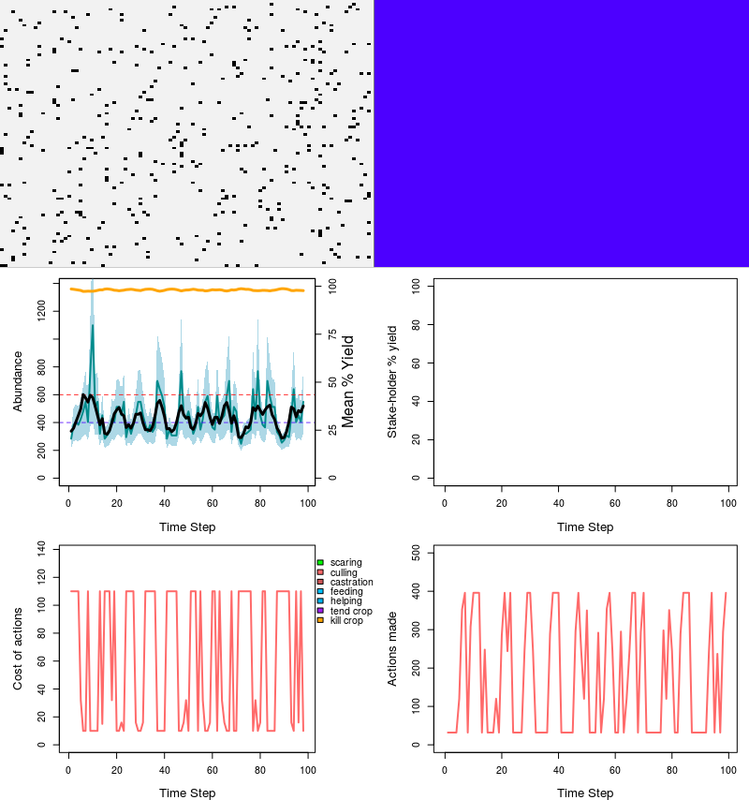 The upper left panel of the plot shows the positions of resources on the simulated landscape in the last time step (had we set plotting = TRUE, the movement of resources over time would be observable). 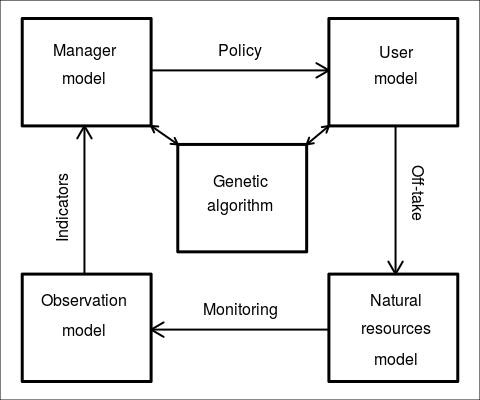 The upper right panel is entirely blue, representing public land that is not owned by stakeholders (to simulate stakeholders that own land and attempt to maximise land values – e.g., crop yield –, use the option land_ownership = TRUE. Land ownership will then be represented by different landscape colours). The middle left plot shows how both actual and estimated resource abundance changes over time. The solid black line illustrates the actual abundance of resources (i.e., the number of individuals) alive in each time step; the solid blue line illustrates how many resources are estimated based on the observation model and the simulated mark-recapture technique of the manager (blue shading illustrates 95 percent confidence intervals, but these are for display only and are not used in manager decision-making). The black dotted line identifies the management target (manage_target = 400), and the red dotted line illustrates the population carrying capacity (res_death_K = 600); note that carrying capacity is enacted on adult mortality (but see also res_birth_K), so abundance can increase over carrying capacity given a sufficient number of juvenile and adult resources (where juveniles are defined as individuals born in the same time step as the current time step). The orange line shows the mean percent yield (right axis) of landscape production, which may be decreased by resources if resources consume crops on the landscape (see res_consume). The middle right panel would show the percent yield of each individual stakeholder’s given land_ownership = TRUE, with solid line colours reflecting yield from identically coloured plots in the upper right panel. The code underlying GMSE has been flexibly developed for future expansion and new features. If there is something that would be useful to add that does not appear to be available by setting parameter values in gmse(), then chances are it can already be done by a few tweaks to the source code, or would require only a bit of additional coding. For example, the code already allows for future expansions to any number of resource types, allowing for multiple populations and structured populations – this is also true for agents.